If you're lazy like me, then sometimes the last thing we want to do is carve pumpkins. I love putting them out for display, but I don't want to do the work, of course. 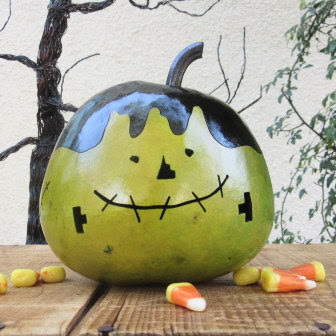 If that's the case check out Pinch Me Boutique on Etsy for homemade Halloween gourds! These are very cute and spooky! You can use these for future Halloween celebrations as well - they won't rot. Each gourd is unique. This is definitely my favorite gourd! 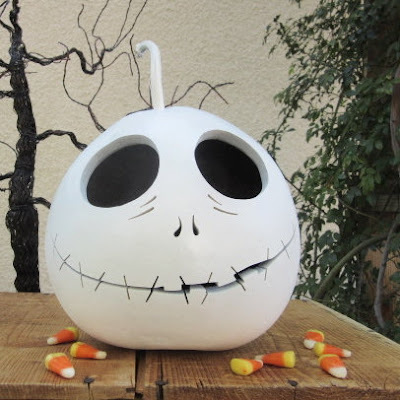 The Jack Skellington gourd has a great smile! I think the best part is that the mouth is partially open, so if you light a candle you can actually see his stitching. I wonder if that's safe though? Either way, he would be cool to have as a centerpiece on Halloween. I don't think I've ever seen a Monster of Frankenstein as cute as this one. It's cool that the top can be lifted up. It would be a great place to hide some candy! The cut is really fun and funky too. I think that this large jack o' lantern ghost top is pretty hilarious. To me, the ghost looks like he's taking the jack o' lantern's soul. That's why his face looks ridiculously goofy! 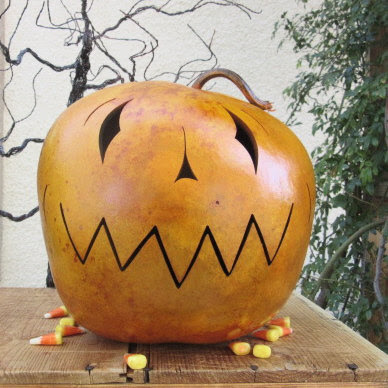 The ghost acts as the lid for this gourd, so you can store whatever you want in it! 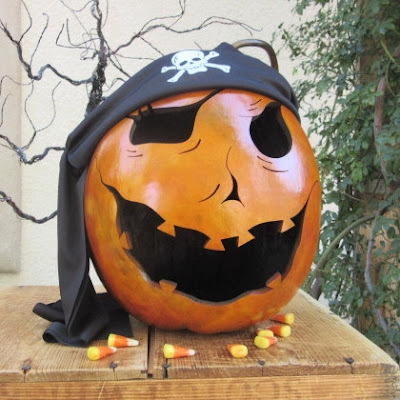 I think that this pirate gourd looks incredibly sinister! I can already imagine him evilly cackling. 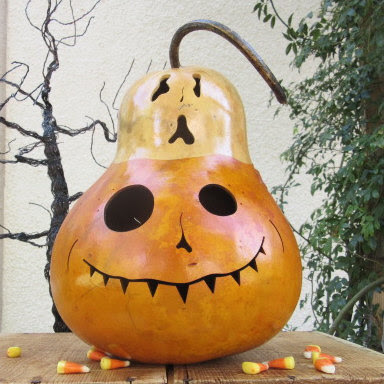 It would be so much fun to be able to light a candle inside this gourd. That way his creepy smile would light up the night! I would probably end up using him as a way to store candy for trick or treaters. That way they will have to stick their hands in his mouth to get their treats! Isn't the purple super cool? The vampire gourd is awfully adorable. You can take the top off, like most of them, and store whatever you want. I would like to line him up next to the Monster of Frankenstein gourd. You could have your own monster mash! 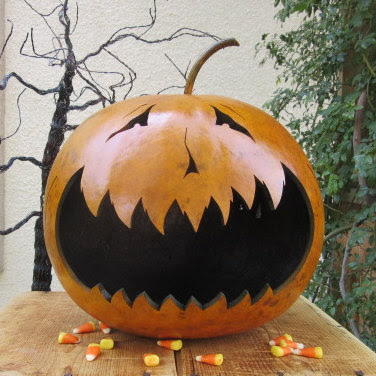 I kind of like this dorky large primitive jack o' lantern. If you're not looking to scare your guests, then this guy is a good option. He actually looks really welcoming, don't you think? If you look at the other pictures, on the back of the pumpkin there's a black cat and tree design. These are super cute and very unique! I think many of my guests would love to know where I got my Halloween gourd. Plus you can use these for many years ahead and not have to carve pumpkins if you don't have to! 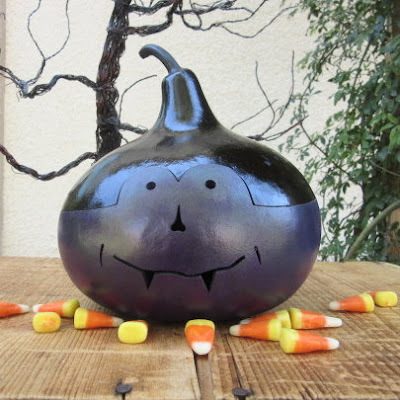 Check out the other awesome Halloween gourds from Pinch Me Boutique on Etsy. Which one is your favorite? Let me know down below!